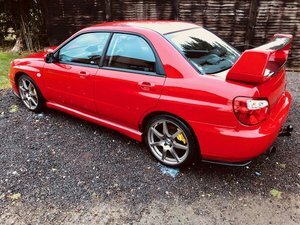 Here we are pleased to offer our rare low mileage 1998 Subaru Impreza Turbo 2000. This is a UK supplied vehicle from new, with only 3 previous owners. Superb service history with a total of 24 services. 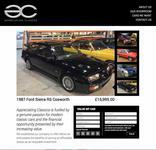 Our last low mileage Turbo 2000 sold within just 3 hours, so we would suggest being quick with this one. 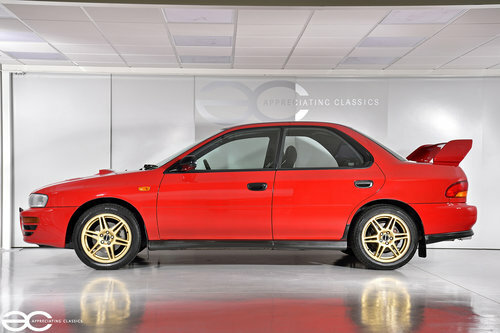 3 previous owners stated on the V5, however, the first was the supplying dealer who registered the vehicle to themselves, then the first private owner 1998 – 2001, then second private owner 2001 – 2012, and then the third private owner 2012 – 2018. 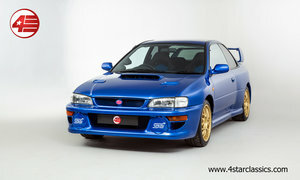 The car comes with original booklets in the original Subaru binder and both original keys plus various tax discs. 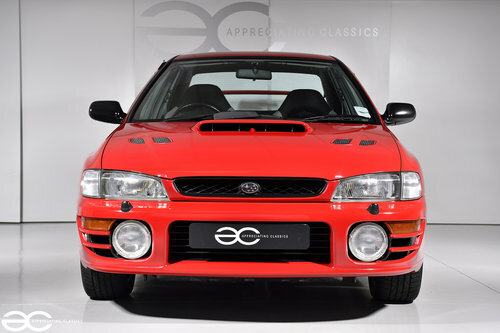 The majority of the service stamps are supported by a matching invoice, and some early invoices are present such as a used car sales receipt to the second owner, and an early invoice from the supplying dealer for the Subaru headlamp protectors – a fantastic history file. Original dealer plates are still displayed. As you would expect with such a well cared for low mileage example, the bodywork and trim of this car is all in great condition. All original decals and badges are still in great order, as are the trims which are all in original finish and have not been painted as is often the case. 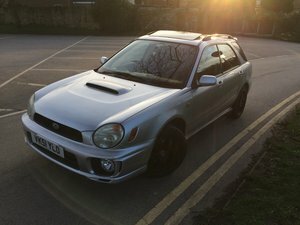 All glass is also original, and the headlights/foglights have genuine Subaru covers fitted meaning these are also in superb condition with none of the usual heavy stone chipping. We have had the paintwork machine polished and it look absolutely brilliant, a great gloss finish with none of the usual cleaning marks / swirling. The wheels are without any damage as well, and have premium tyres fitted all around (Bridgestone Potenza). 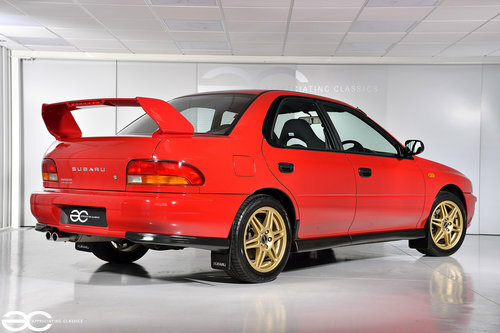 As can be seen, the original exhaust is still in place with the only change to the car being the taller Prodrive rear spoiler having been fitted – we were told at point of purchase that this was done at the supplying dealer but we have no proof of this. The interior of this Subaru is really very good indeed. Everything is original other than the CD Player – the original stereo is still with the vehicle and is in great condition. As can be seen in the pictures the seats look to show virtually zero wear at all, and the same can be said for the rest of the interior. All carpets are without any kind of damage, and the original Subaru rubber floormats are still in place. Pedal rubbers, steering wheel and gear knob are all in nice order, and all switchgear works just as it should do. All plastic trims are in great condition, even the kick plates upon entry look fresh. With 24 services having been carried out, that equates to a service once every 922 miles! Of course, the car runs very nicely as you would expect, and has no smoking at all, either on cold start, idle, on boost or on overrun. 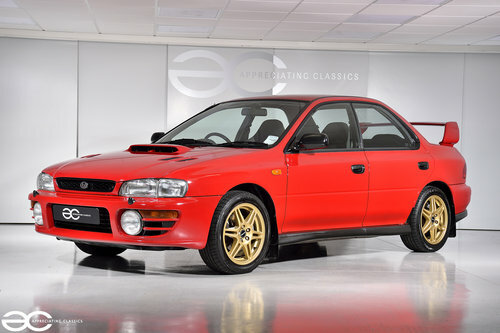 No hesitations through the rev range, it drives exactly as Subaru intended with no performance modification having been carried out. 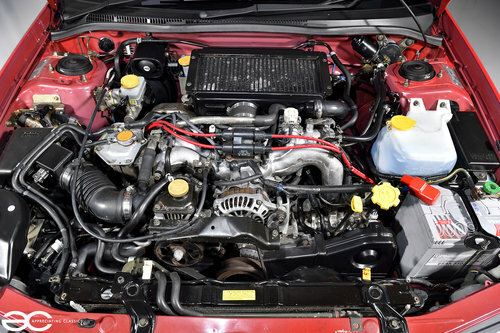 The most recent service was carried out in June 2018, and this included a new water pump. The engine bay itself presents well, although this is the one area of the car which could be improved upon – anybody who knows these vehicles will know that the bolts/fixings etc show signs of age very quickly and easily thanks to the materials used and poor/thin coatings applied. Whilst it is presentable, it would be great to see a new owner bring the engine bay up to the standard of the rest of the car with ease. The underside of this vehicle has clearly been undersealed in the past, as is very common with most 90’s Japanese vehicles with them having such little protection from the elements. Having said that, all running gear presents nicely, just showing the usual age related tarnishing in places. The car drives fantastic, with strong braking capabilities and superb handling characteristics. All four tyres are matching Bridgestone tyres and have clearly done very few miles. 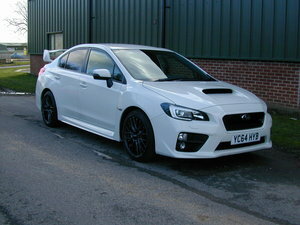 The gearbox and clutch operate superbly, with a great feeling gear change as is often the case with a Subaru.